As always we are busy with numerous chores. We have been blessed with some rain and a couple severe storms. We lost an old barn to the wind but will always take a rain in July or August. A barn is damaged by the severe winds that come with a summer storm. 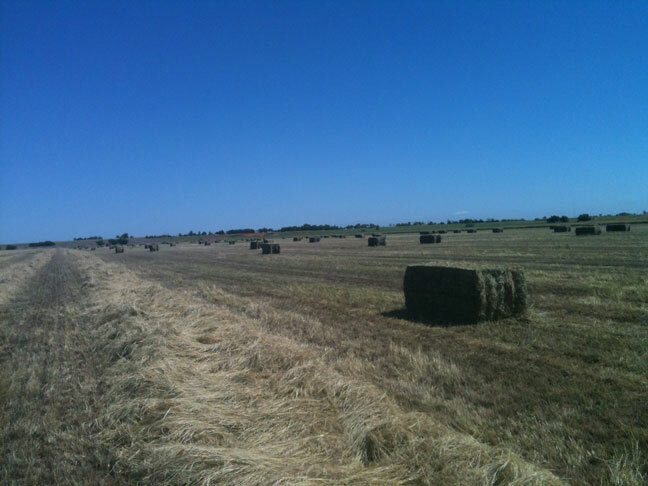 Our hay yields and quality continue to be excellent. Even with a glut in local hay, quality still sells and we are thankful for that. The haying process is underway at the Bolen farm. We have been on the hunt for a new ram and found just what we were looking for with a buck named Crown Royal. It’s always intriguing waiting to see what new genetics will do for next year’s lamb crop. The Bolen’s new ram Crown Royal. Our breeding season for the sheep will start at the end of August for late January lambs. The girls are busy almost daily working their show lambs for the fall show season which kicks off the first week of September at our county fair. The Webb family feeding cows in the snow. Monday, February 26th brought with it 3 inches of rain followed by 12-15 inches of snow. The winds got up to 40 mph causing quite a blizzard. Wade and I had put out a good amount of hay Sunday afternoon in case the snowstorm came in like the forecasters had predicted. Monday afternoon we were sure glad we had done so. We purposely keep our mother cows in pastures where they can find protection from the wind in wooded areas during the winter months. So when a storm like that hits, we leave the cattle alone until it passes over. We woke up Tuesday to clearing skies and a blanket of white. We fed with two tractors and a pickup. I had a dozer blade on the tractor I was in and pushed open a trail. Some of the snow drifts were over 5 feet tall. Wade followed in a pickup with 2 bales of hay and a box of cattle feed and Clayton followed in a tractor carrying 3 bales of hay. We started about 8 that morning and rolled in around 7 that evening. We lost our electricity Monday at 12:30 pm. We hooked up a generator later that afternoon and ran it until Saturday evening. Wednesday’s feeding ran about the same. Thursday we were able to feed with two pickups and one tractor, which sped up the feeding quite a bit. Most of the snow was melted off by Sunday afternoon. We ended up with a little over 4 inches worth moisture and are thankful for every bit of it. Assembling a hay ring to feed with. The crew heading out to feed. Clayton putting out hay for cattle during the snowstorm. 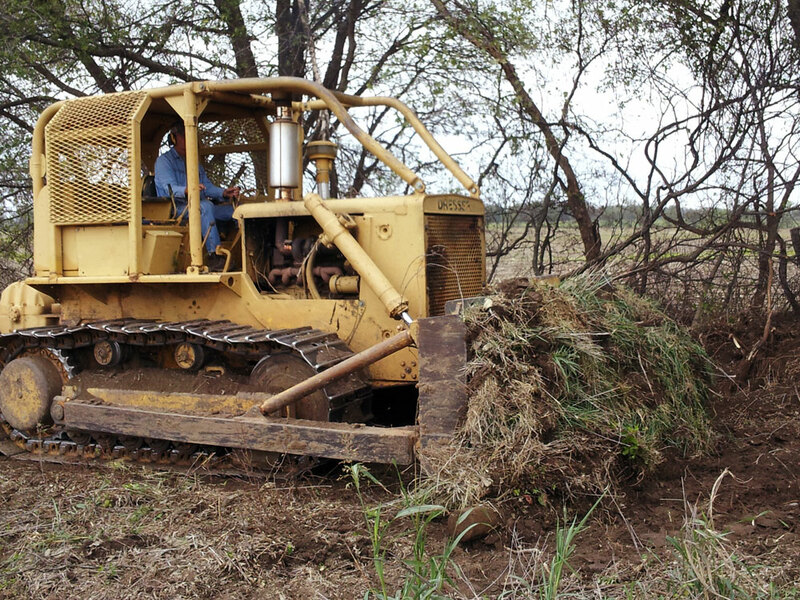 Cleaning up fields with a bulldozer. Fall is here as we have now had a killing frost and survived the Tulsa State Fair!!! After a month of fixing washes and drain problems with the scraper and bulldozer, we are now into planting wheat here in northeast Oklahoma. We also baled the last of a very short hay crop, rolling up about 50 bales of Bermuda grass and weeds. We have cleaned up an old house site at one farm and fixed several terraces and waterways around the farm trying to prepare for wheat planting. We started planting wheat on October 4th and are now down to 115 acres of our wheat left to plant before soybean harvest starts in a couple weeks. We do have 300 acres of custom planting to do for a neighbor to help him out as well as ourselves since we have the new drill to pay for. I also planted about 350 acres of rye grass and cover or vetch into pastures for me and other neighbors this fall after getting the new drill. What a year this has been with record heat and dryness, then record-early killing frost, and now 4.5 inches of rain over a two-day period this weekend after just planting 600 acres of wheat. I’m guessing that at least we will be out replanting spots if not whole fields because of the hard, quick 3.5 inches last night. Don’t take me wrong; we needed the rain very badly – just not that much that fast right after planting. Greg and Danish visitor Jens Peter Hansen discuss Greg’s equipment. Last week we had a very interesting visitor that found his way to us from Denmark from reading this blog and contacting Oklahoma Farm Bureau and arranging a visit to our farm while he was in Oklahoma speaking at a conference in OKC. Jens is an extension specialist in Denmark and was very interested in the precision farm tools that we use on our farm. After looking over some historical data, we looked at the machinery we farmed with. Then we went out and rode in the tractor planting wheat with our new 40-foot grain drill using RTK auto steer with saved guidance lines. He had a great time and I very much enjoyed the exchange of ideas and learning much about the extension service and farming in Denmark. Tulsa State Fair livestock show preparations. I attended our local county extension PAC committee meeting this week to help out county ag extension agent plan what programs we need in our county. Kody is still doing well at NEO A&M College and is excited that the first tractor he bought is going to be delivered on Monday. He bought a John Deere 7800 MFD with a 740 loader to replace the tractor we had stolen last year while we were at state Farm Bureau convention. 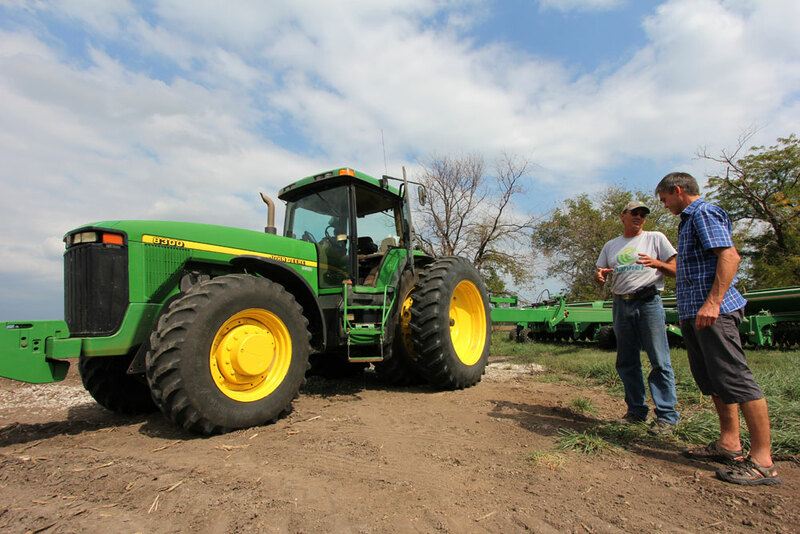 Greg and Jens go over the auto steer and grain drill controls in the tractor cab. Mowing hay in preparation for baling the last of the 2012 hay crop. The view from the tractor as wheat is seeded on the Leonards’ farm. We had a customer appreciation dinner in the front yard and a farm tour. The dinner was made from the garden. We ate outside sitting on straw bales covered with quilts. The tour was a hay ride on old wagons. Everyone enjoyed the farm experience and the evening together. It was pleasant. For me it was meeting the nice folks that buy my son’s vegetables. We filled up most of our barns with a cutting off of his alfalfa hay field. The joys of hay season and plugged up balers. Amy. She stayed in a hotel in the city with some of the other girls. I told her she was not allowed to go on “vacation” again during hay season! It seems like my kids are playing ball all the time. I bought Amy a Volkswagon Jetta diesel around the first of April and she has already put 5,500 miles on the car! I don’t remember playing ball this much when I was that young. Rylan, my kindergartener, plays at least 2 days a week and Kenda, my eight year old, plays a double header one night a week, practices 2-3 times and sometimes has a scrimmage too! Most days I don’t remember what my living room or my wife looks like other than driving down the road – usually in opposite directions! The only days off from ball seem to be Wednesday and Sundays and we teach at church those days! Speaking of being hooked up; I started hooking my old combine up to the headers today. We bought 2 new ones if you recall from earlier blogs, but I retained the right to lease one of our old ones so we could run an extra combine that I trusted. Since I am waiting for the new ones to be delivered early next week, I just couldn’t stand not having a combine in the yard as I am watching all the harvesters head to Texas loaded down! Our Sam’s Club purchases for this year’s harvest crew. Amy and I had our own experience of being “loaded down!” We had to leave a vehicle at her parents’ house after the funeral last week because she was sick with the flu and couldn’t drive home. We decided to leave the suburban because it stays parked most of the time since we bought the jetta. 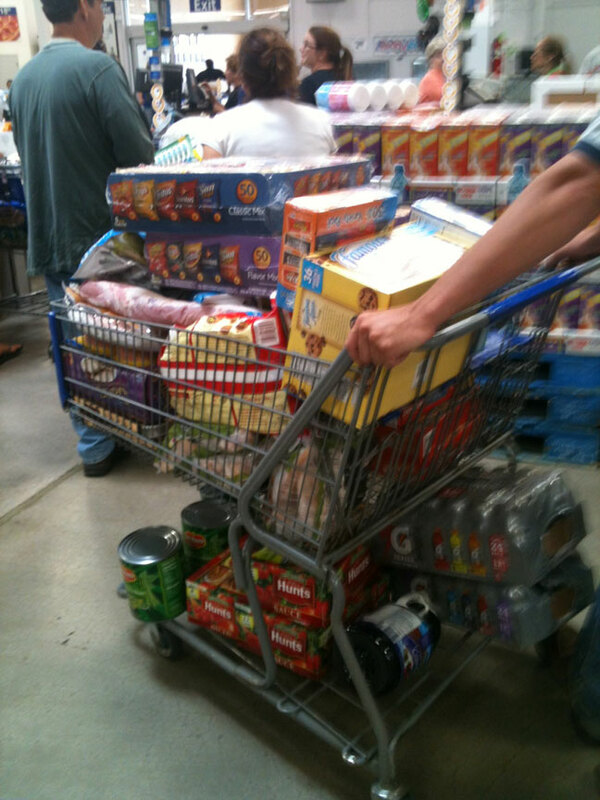 Well we kinda forgot that this week we would need to make our big haul to Sam’s Club for our harvesting food supplies. 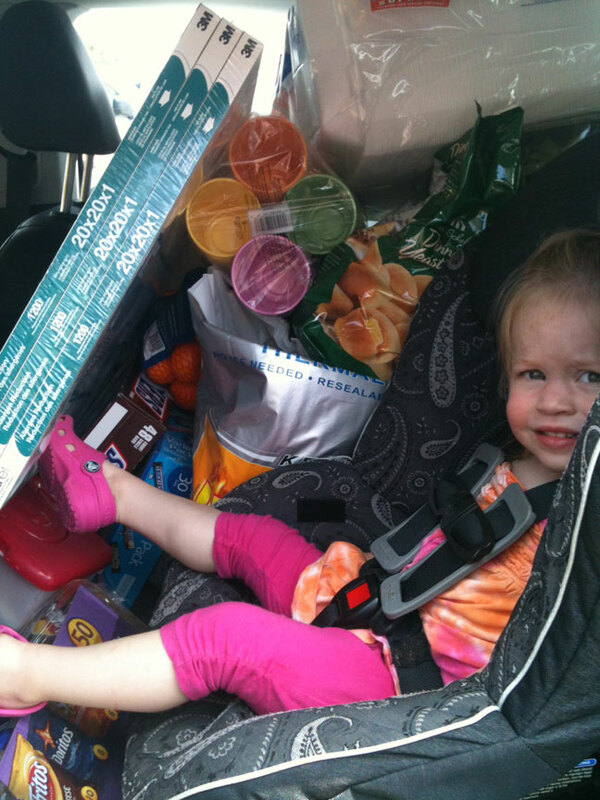 Harvest food and Trale – a snug fit for the Jetta! harvest but it requires about $1000 worth of products from Sam’s. We went in the Jetta! We were completely loaded down, but the food will be completely worth it. Finally, we’re getting ready to plant cotton. Sure would have liked to have tried to plant April cotton but we just barely missed it because of the rain. After praying every day for 76 days last year for God to send moisture, I won’t complain any because He shows us how good He is with many answered prayers. So our cottonseed and Hydra-Hume is here sitting in the barn. Hydra-Hume is a product of humic acid that helps make the nutrients already in the soil more available to the plant. I’m planning on re-schooling Marshall, my dad, on all the electronic components in the tractor for auto-steer, etc tomorrow. I still need that grain cart driver, please apply now! Time is running short as there is a strong possibility that a sample of wheat will be taken in just over a week! This may set the record for earliest wheat crop to be cut. Can anyone recall an earlier time? For me, I’m excited to get harvest here but others I still think are in a little bit of denial that wheat harvest will be so early. Over the last year days, all of the fields have turned yellow and there’s not a field of green wheat left in this part of the world. You can still see some green heads in the terrace channels and outside rounds but these 100 degree days and blowing winds will change that in a hurry! Hopefully you can see the difference in wheat from this picture that my phone snapped! Probably in two weeks I will be updating from the seat of a combine! Stay tuned and have a blessed week. Well it’s been a long but rewarding two weeks. We started laying down hay April 15th and finished baling April 28th. I’ve never cut hay this early but everything worked out just fine. To make things even better, we received a nice two-inch rain the night we finished baling. Our custom wicking is just about to wind up. We’ve had a good run this spring. Brandon in the field raking hay. 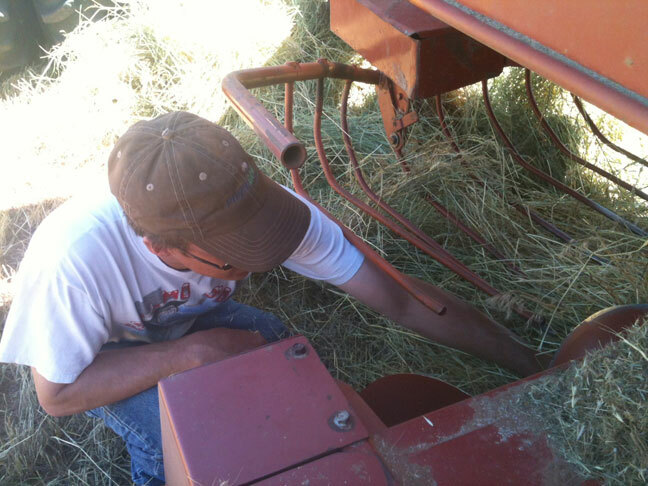 Our son, Clayton, swathing hay. Our son, Wade, baling hay with surface wrap. Finishing up wicking rye for some of our customers. Clayton and I went to a “precision farming” meeting in Enid last week. It was put together by our John Deere dealer. We use GPS guidance on all of our equipment and actually “documented” our yield for the first time during last year’s wheat harvest. Due to the drought, we only cut half a crop on the half of our grain acres that didn’t completely burn up but still, it got us started in yield documentation. I have spent the last several years moving in this direction. We plan to utilize grid sampling and harvest information to implement variable rate fertilizer, lime, and seeding rate prescriptions on our grain acres. We still have a ways to go but we’re heading in that direction. 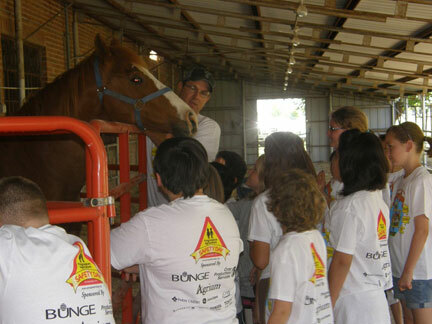 Brandon teaching animal safety to 4th graders during our annual farm safety day. 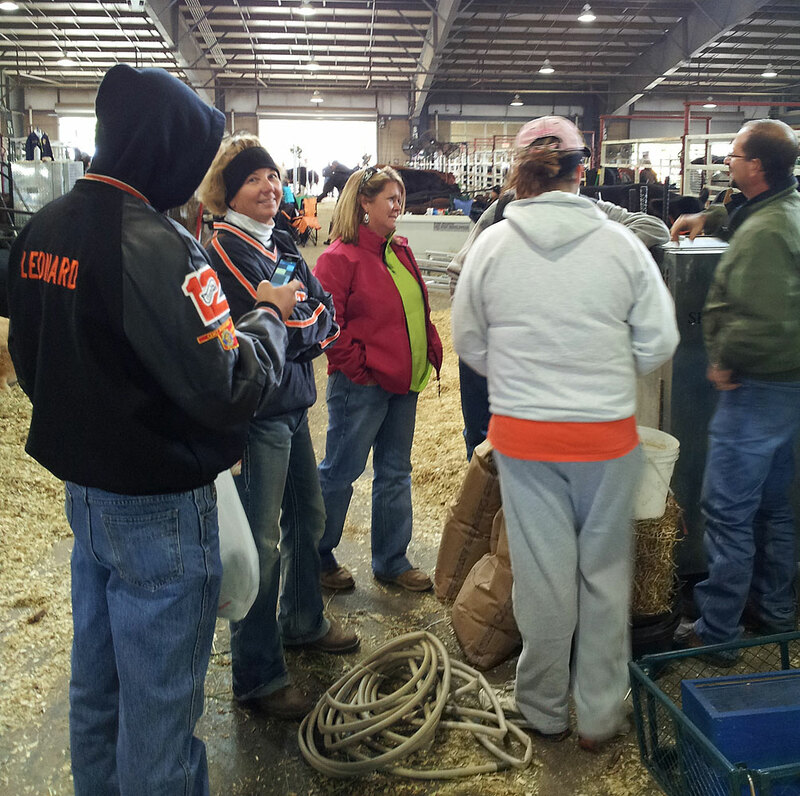 County fairgrounds for a day of learning. Cari and I address “animal safety” for the day. We had this year’s farm safety day last Wednesday. It is always quite interesting interacting with so many kids. I think we had about 100 kids this year. This week we will get back to working our cattle. We’ve got several more groups to get through. This past week we pregnancy checked 108 home raised replacement heifers. We exposed them to bulls for 70 days for an October-November calving period. Our heifers are usually 13-14 months old when we expose them to the bulls. Typically, we leave the bulls with them for 60 days, but like everything else, the drought caused us to do things early, so we exposed this set of heifers when they were 11-12 months old. We left the bulls an extra 10 days to try to compensate for the younger heifers. We ended up with 89 bred out of the 108 or 82%. I think that is great. Our older heifers usually hit somewhere between 85-88% bred at 60 days. So maybe the extra 10 days helped make a difference. I’ll know this fall when they calve. We also have a lot of hay to get hauled in from the fields this week. We haven’t moved any of it yet. We round bale all of our hay and use a plastic netting called “surface wrap.” It protects the hay quite well from rain damage, so once it’s baled we’re pretty safe. We’ll let the wheat fields we cut for hay leaf back out and spray them with a chemical “burndown” using glyphosate. We’ll also spray the wheat fields we grazed out at that time too. We rotate hay crops and grazing out wheat fields to help keep the feral rye in check. Therefore, we want to be sure and kill everything left in the field to clean them up. Wade gets out of school May 11. That’s about a week earlier than we’re used to but we’re glad, I know he’s ready for summer to be here. If everything stays on this early schedule, we might be cutting wheat by May 21st. We’ll see.